I attended a panel discussion this weekend that featured a couple well known deer biologists from the middle Tennessee area, Bryan Kinkel, a private consultant, and Daryl Ratajczak, the Big Game Program Coordinator for the Tennessee Wildlife Resources Agency. Bryan and Daryl fielded questions on a variety of topics and did a terrific job of addressing several hotly debated topics including bag limits, antler restrictions, and baiting. On the subject of "why baiting is illegal in Tennessee," Daryl and Bryan agreed that there are a variety of biological reasons including disease transmission among deer and possible toxicity to wild turkeys. It was a non-biological reason that really resonated with me, however. One of them (I can't remember who) said that baiting lowers the skill level of hunters since they never have to get out and actually learn to scout. I agree with that point, but I would also add that by not scouting, you miss out on the best part of hunting which is getting out and learning about the natural world by observing and participating in an activity as old as life itself. I love scouting. In fact, I actually enjoy scouting as much as I enjoy sitting in my treestand (what most folks would call hunting). If you'll scroll up to the top of the page, you'll see my mantra that "hunting takes place before you climb into your stand, everything after that is just shooting." Seems like every time I hit the woods, I learn something new. This past weekend was no exception. In addition to locating several promising-looking spots for the opening of bow season in a couple short weeks, I made three discoveries that may or may not ultimately contribute to my success as a deer hunter but which added to my knowledge of and appreciation for the world that deer live in. 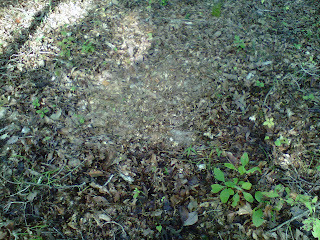 I found this deer bed near the first dominant tree I found this year. The bed was obviously fresh because the leaves were dry while the surrounding area was damp from an overnight shower. 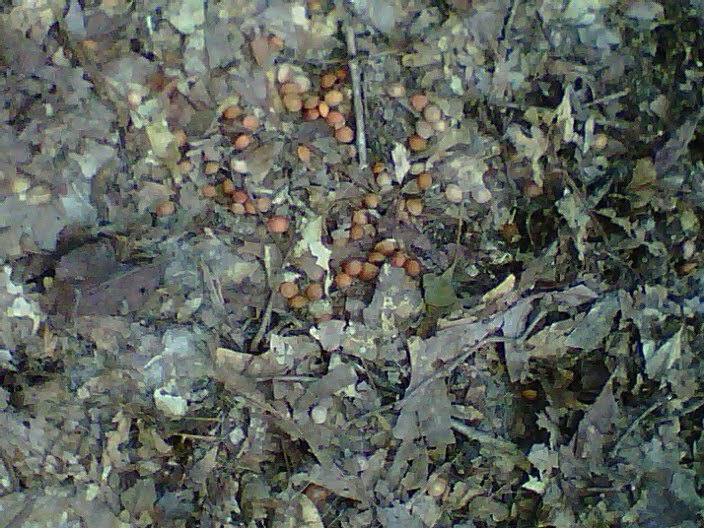 As I looked more closely, I discovered a pile of wild plum pits that had apparently been separated out of the cud of the bed's recent inhabitant and spit out in a neat little pile. When I picked one up, it was still moist. I never did find the source of those wild plums (which are not very common in my area), but you can bet your last dollar that I will be keeping my eye out for it in the future. I'd be plum crazy not to! After checking literally hundreds of white oaks with binoculars, looking for acorns, I looked up in what I originally thought was a white oak but saw leaves that look nothing like anything I've seen before and acorns that were absolutely huge. I searched around under the tree and found a couple of acorns that look like white oak acorns on steroids - luckily, one of them had a couple leaves attached. On closer examination, I noticed that the bark lacked the characteristic flaky appearance of a white oak. I've checked every tree reference I know of and can't find any species that matches the physical characteristics and the location of the tree (on a south-facing upland ridge). I did find several references on the web to hybrids of white oaks and chestnut oaks which I believe this to be. 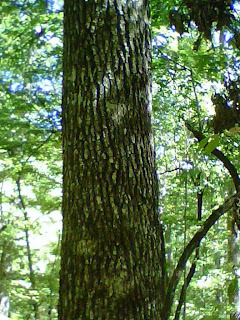 That hybrid is actually common enough to have a name, the Jack Oak or Saul Oak. 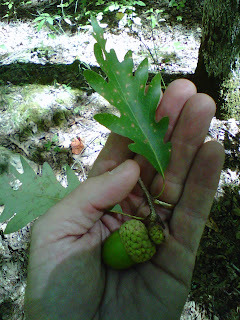 Based on the size of the acorns, their white oak lineage, and numerous old feeding rubs in the area, I have high hopes that this tree will be a hot spot when it starts dropping nuts in a couple weeks. How cool would it be to kill a nice buck under this unique tree? I will definitely be keeping an eye on it. Update: I found this article from a scientific journal that describes and illustrates the characteristics of a chestnut oak/white oak hybrid, scientific name Quercus Saulii. The tree I found matches every leaf, acorn, and bark characteristic described in the article. 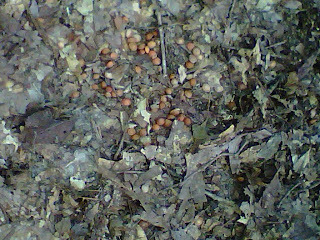 So I'm riding along a logging road on my four wheeler, minding my own business, when I catch a whiff of something dead. 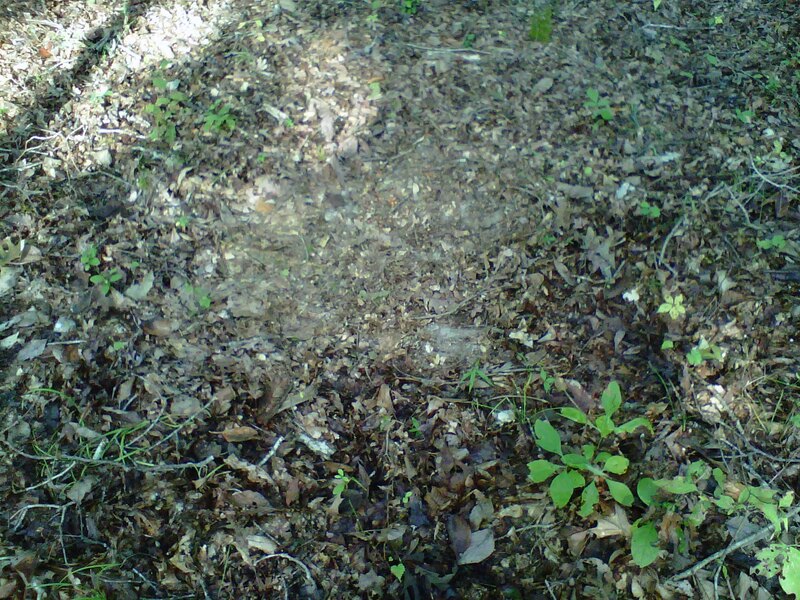 A couple guys on TnDeer.com had been talking recently about finding isolated pockets of deer that had apparently died of EHD. With that in mind, I grabbed the brakes and came to a quick stop to check it out. The wind was swirling around so the odor came and went a couple times. I dug out my handy bottle of milkweed floaters and launched one the next time I got a whiff of death. Getting a fix on the wind direction, I began backtracking upwind expecting at any minute to see a decomposing deer. Instead, I found this. I swear I'm not making this up. This thing looked like, well I don't need to tell you what it looked like, but the end of it was covered with a vile greenish-brown goo that looked like poo and stunk to high heaven. The flies were climbing all over each other to get to the poo-goo. You can click on the photo to get a better look. 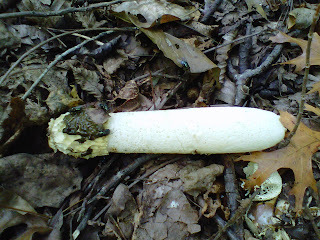 Turns out it is a type of fungus called (appropriately) phallus impudicus, commonly known as a stinkhorn and that foul-smelling goo is full of spores that are spread by the flies that land in it. It never ceases to amaze me how nature adapts to ensure the survival of even the most vile-smelling fungus. I'm also baffled that anyone who calls himself or herself a hunter would miss out on the education that you can get by simply walking around in the deers' world and observing. The satistfaction that I would get from killing a deer over a pile of corn wouldn't hold a candle to the pleasure I get from all the little stuff I learn when I take to the woods. Thanks Bryan and Daryl for making me think about that. That fungus sure is something! lol! Thanks for sharing and good luck to you this season. That Jack Oak spot sure looks like a good one! That would certainly be a giant! lol! Ahhhh the bait thing. Fully illegal here in VT. I agree with the scouting and skill part. Here in VT hunting is tough with few deer and decreasing areas to hunt with so much posting and so many hunters. We take our deer with great pride when we get them because your lucky if you do. I dont hunt over bait. Just wouldnt get the satisfaction when i make the kill. Kinda why i bowhunt and do limited rifle hunting. Feel as though its too easy. Great post!